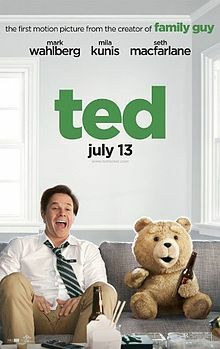 Ted was without a doubt the funniest movie of 2012. The film weaves together more types of humor than I can imagine. It’s a crude, crass, vulgar, silly, raunchy, stupid, quirky, dark, dry, clever, witty, well written, laugh out loud, pee your pants, riot! It was absolutely and utterly hilarious! If you’re a fan of the TV show Family Guy, then you will love Ted. Both shows have the same type of comedy because they were both created by the same funnyman genius, Seth Macfarlane. There are many similarities and differences to both shows. Family Guy is an animated TV show, while Ted is a live action movie with the title character being the only one that is computer animated. In Family Guy there is a talking baby and a talking dog, while in Ted there is a talking teddy bear that has come to life. Ted is able to get away with a lot more rude humor because it is rated R and unrated, while Family Guy is a little more toned down because it’s on TV. If you are familiar with the TV show Family Guy, then you probably know that Mila Kunis supplies the voice of Meg Griffin and Seth Macfarlane contributes the voice of Peter Griffin. 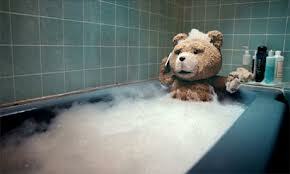 Kunis plays Mark Wahlberg’s girlfriend in Ted, and Macfarlane does the voice of Ted. Oddly enough Seth Macfarlane did the same voice for both Peter Griffin and Ted. They sound the same. He didn’t bother to make them different. Honestly, I don’t know which one is funnier. 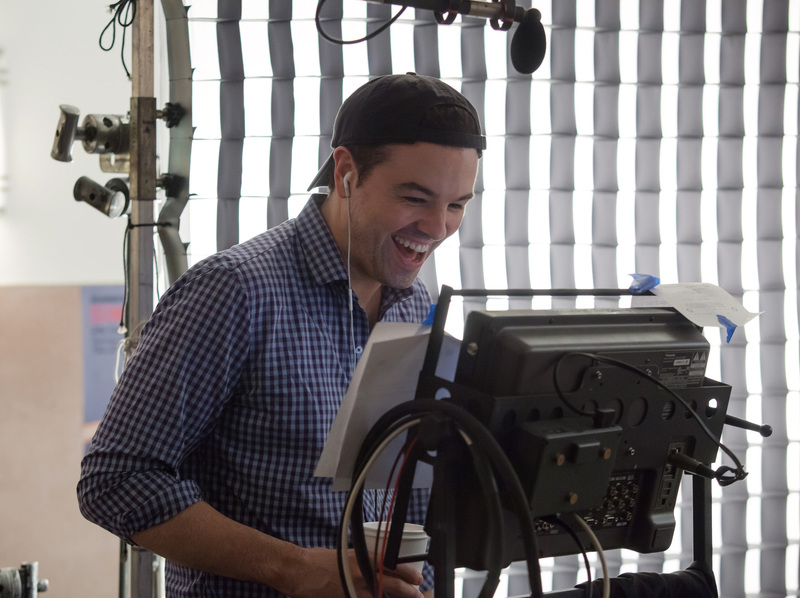 Macfarlane does an excellent job directing the entire cast to make Ted as real as possible. It’s not long before you forget that Ted is not a living thing. The actors do a wonderful job interacting with something that is not even there. I think that Walhberg does an especially good job in his scenes with Ted and making them believable. Mila Kunis is actually very likable in Ted as opposed to her character Meg in Family Guy, who everybody loves to hate. Giovanni Ribisi adds an awesome lunatic character to the film. It is another one of many weird roles that he adds to his resume’ of crazy characters. Patrick Stewart narrates the film and even he is quite comical. If you are looking for a good laugh and are into all types of comedy, then this movie should do the trick. I rate this movie a 9 out of 10. Posted on January 20, 2013, in Comedy Movie Reviews and tagged Family Guy, Giovanni Ribisi, Mark Wahlberg, Meg Griffin, Mila Kunis, movie, Patrick Stewart, Peter Griffin, Seth Macfarlane, Ted (2012). Bookmark the permalink. 2 Comments.